We appreciate your consideration of this request. We are praying for Venezuela’s swift recovery and for the day when those who have fled to the safety of other countries may return home. Linda Bordoni, Venezuelan Bishops Urge Prosecutors to Uphold Human Rights in the Face of Violations, Vatican News (Feb. 20, 2019), available at https://www.vaticannews.va/en/church/news/2019-02/venezuela-bishops-justice-human-rights-violations.html. USCCB’s Department of Migration and Refugee Services (“USCCB/MRS”) has operated programs, working in collaboration with the U.S. government, to help protect unaccompanied children from all over the world for nearly 40 years. Since 1994, USCCB/MRS has operated the “Safe Passages” program. This program serves undocumented immigrant children apprehended by DHS and placed in the custody and care of HHS’s Office of Refugee Resettlement (“ORR”). Through cooperative agreements with ORR, and in collaboration with community-based social service agencies, the Safe Passages program provides residential care (i.e., foster care and small-scale shelter placements) to unaccompanied children in ORR custody, as well as family reunification services (i.e., pre-release placement screening (“home studies”) and post-release social services for families (“post-release services” or “PRS”)). In fiscal year 2017, the USCCB/MRS Safe Passages program served 1,294 youth who arrived as unaccompanied children—1,042 through the family reunification program and 252 through residential care programs. Additionally, the Catholic Church in the United States has long worked to support immigrant families who have experienced immigrant detention, through the provision of legal assistance, visitation, and pastoral accompaniment to those in immigrant detention facilities, as well as social services assistance to those released. 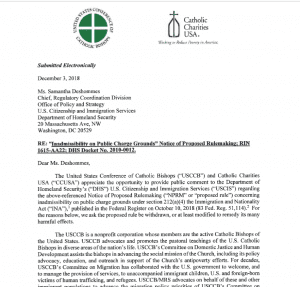 USCCB/MRS has also operated several alternatives to detention programs to assist immigrant families and other vulnerable populations.3 Through all of this work, we have seen first-hand the importance of the protections set forth in the FSA, and we have worked to help implement and ensure government compliance with these requirements. We understand that parties to the FSA contemplated, in the 2001 stipulation, the publication of regulations implementing the agreement’s terms.4 The stipulation modified the provision providing for termination of the agreement, noting that the FSA would terminate “45 days following defendants’ publication of final regulations implementing this Agreement.”5 This language, however, also makes clear that the parties and the court envisioned such regulations as reflecting or “implementing” the terms of the agreement, not seeking to expand or change them. Nevertheless, the NPRM published by DHS and HHS proposes substantial changes to the terms of the FSA. This proposal is, unfortunately, an attempt to amend unilaterally the conditions to which the government previously agreed and which were entered by the Flores court, and, if implemented would drastically undermine protections for children. DHS’s and HHS’s efforts to revise the definition of “emergency” and the corresponding emergency exceptions to the FSA requirements, as it would provide the government with more leeway to breach the agreement’s terms. Additionally, in a fifth subsection, USCCB/MRS offers its concerns and suggestions in response to HHS’s specific request for comments on the possibility of adding regulations regarding the standards for home studies and post-release services. 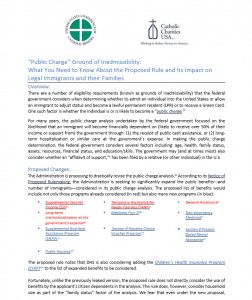 USCCB/MRS recognizes that both DHS and HHS will have corresponding responsibilities under the proposed rule and that a separate set of rules would apply accordingly. DHS will revise 8 CFR § 236.3 while HHS will create a new 45 CFR Part 410. USCCB’s comments are related to both proposed sections. These comments turn first to the DHS sections and then to the HHS sections. 8 CFR § 236.3(b)(9) – DHS’s Revised Definition of “Licensed Facility” Seeks to Circumvent Court Decisions and Expand an Inhumane and Costly Practice. The FSA requires that children be placed in facilities that are non-secure and “licensed by an appropriate State agency,” unless placement in a secure facility is otherwise required.6 The three FRCs – Karnes County Residential Center, Berks Family Residential Center, and South Texas Family Residential Center – currently operate a combined 3,326 beds.7 These facilities, however, are not licensed for childcare in their respective states and, as such, fail to meet basic child welfare requirements currently set forth in the FSA. The proposed rule seeks to create an alternative federal licensing scheme for such facilities when state licensing schemes for detention of accompanied children are “not available.”8 This revision would allow for FRCs that cannot be licensed in the state in which they operate to detain accompanied children if they meet the standards set forth in 8 CFR § 236.3(i)(4). DHS proposes to employ an independent entity to monitor compliance with these standards. As detailed below, we object to this proposal because it contravenes the FSA on its face, seeks to circumvent numerous decisions by the U.S. District Court for the Central District of California, and raises serious public policy concerns. As an initial matter, the plain language of the FSA requires that facilities holding immigrant children be licensed by the state.9 This language leaves no room for ambiguity or alternative interpretation, and DHS cannot post-hoc supply an alternative licensing definition simply because the state schemes do not currently allow for licensing of its FRCs. In fact, Judge Gee, for the U.S. District Court for the Central District of California, has repeatedly found during recent litigation regarding the FSA that “[t]he fact that the family residential centers cannot be licensed by an appropriate state agency simply means that, under the Agreement, class members cannot be housed in these facilities except as permitted by the Agreement.”10 Further, when the government specifically requested an exemption to the temporal limitations placed on detention of children in unlicensed facilities earlier this year, the court denied the request.11 In its justification for the NPRM, DHS makes the same arguments that failed before that court. Its proposed rule is consequently no more than an improper effort to find an end-run around the existing limitations and judicial decisions, via rulemaking. In addition, DHS’s suggested definition would allow for vastly expanded use of family detention. The proposal would permit DHS to detain many of the accompanied children entering the country with their parents in the existing FRCs through the duration of their immigration proceedings. As discussed below, such a proposal presents significant public policy concerns given the negative impact it would have on accompanied children, their families, and the U.S. taxpayer. DHS’s justification for proposing to alter the FSA’s licensing requirements not only fails to address these concerns, but it also consistently dismisses the fact that it has a spectrum of humane, proven, and cost-effective alternatives to detention (ATDs) that it can utilize – and is utilizing in some cases – to monitor families released from custody. Such alternatives are typically preferable, as they avoid inflicting unnecessary and long-lasting trauma on children and families. Additionally, detaining families that do not present a flight or safety risk is an unnecessary use of limited DHS resources. DHS has projected that in Fiscal Year (“FY”) 2019 family detention will cost approximately $319 per individual/per day.21 This compares to just over $4 per individual/per day for those enrolled in the Intensive Supervision Appearance Program (“ISAP”) III22 ATD program or $36 per family/per day for those in ICE’s former Family Case Management Program.23 Consequently, even though it takes longer to process individuals’ immigration cases when they are not detained,24 the government – and by extension the U.S. taxpayer – would save, on average, an estimated $22,512 per family (one parent, one child) if DHS released the family and placed the parent on ISAP III, rather than detaining them in an FRC.25 For these reasons, we urge DHS to minimize the use of family detention. DHS should revisit existing policy and program options currently available to it, such as ATD programs and family case management rather than seeking to unilaterally amend the FSA. Additionally, even assuming that DHS’s federal licensing scheme is theoretically permissible and otherwise meets the FSA requirements – and, as discussed below, it does not – the proposed definition essentially allows DHS to self-certify its facilities for compliance with the licensing requirements. While the proposal contemplates hiring an outside entity, this entity would be employed by ICE, which calls into question such an entity’s ability to truly be independent and ensure compliance. In contrast, the FSA requires certification by an outside and fully independent entity with expertise in child safety – the state’s child welfare agency.26 Furthermore, DHS already contracts with Nakamoto Group, Inc. to inspect some of its adult detention facilities, but DHS’s Office of Inspector General has found that the contractor is unable to provide effective oversight because its “inspection practices are not consistently thorough, [and] its inspections do not fully examine actual conditions or identify all compliance deficiencies.”27 DHS’s proposal to allow certification by an entity that is not wholly independent of the agency is extremely problematic, in light of the serious deficiencies with DHS’s current compliance contractors, as well as the compliance issues that have already been documented in the FRCs.28 To allow such a scheme would run directly counter to the stated child welfare protections in the FSA. 2. 8 CFR § 236.3(i) – DHS’s Proposed Federal Scheme for Licensing Family Detention Centers Fails to Adequately Mirror the FSA. Even assuming that an alternative federal licensing scheme for detention centers should be permitted – and, as discussed above, it should not – DHS’s proposed scheme fails to adequately implement the terms of the FSA. DHS suggests that its proposed licensing scheme is sufficient because the standards set forth in 8 CFR § 236.3(i)(4) “mirror the requirements in Exhibit 1 of the FSA and the current ICE Family Residential Standards.”29 It further claims that its proposed federal licensing scheme “provide[s] materially identically assurances about the conditions of such facilities.”30 For the following reasons, we disagree with this assertion and are deeply troubled by DHS’s proposal. These are clear and concerning differences between the Texas state and ICE FRC standards that impact the safety and wellbeing of children in federal custody. Not only do ICE’s FRC standards fail to mirror the state requirements contemplated by the FSA, but there is no reasonable justification to eliminate these requirements. Detaining a child with his or her parent(s) does not inherently necessitate use of handcuffs or prolonged restraint. In other instances, even where it may be the intent of ICE to replicate state requirements, the FRC standards do not always adequately accomplish this purpose. For example, Texas regulations require that licensed residential facilities “feed an infant whenever the infant is hungry.”41 This unambiguous directive is not matched in ICE’s FRC guidelines. Rather, the FRC standards state that a facility must meet the “minimal nutritional needs of toddlers and infants” and “meet recommended government guidelines for well-baby and well-child growth and development.”42 While one might assume that ICE is referring to the U.S. Department of Agriculture, Food and Nutrition Service’s guidelines,43 this would be entirely speculative since as no specific government guidelines are provided. In fact, the exact requirements remain ambiguous and leave room for various interpretations as the FRC standards neither footnote the guidelines nor attach them as an appendix. Given this ambiguity, ICE’s FRC standards fail to provide infants with the same clearly defined protections as the Texas state licensing requirements. These examples highlight the manner in which ICE’s standards fail to adequately mirror state standards and illustrate how the federal licensing scheme proposed by DHS is insufficient under the FSA. If it is determined that a federal scheme is appropriate, DHS should conduct a detailed review of each individual provision of the state licensing standards in Texas and Pennsylvania to determine whether it is: i) relevant and transferrable to facilities detaining accompanied children; and ii) stricter than the existing FRC standards, if any exist on the topic. Without such a review and revision of ICE’s FRC standards, the agency’s assertions that the federal scheme “mirrors” the state standards is unfounded at best. Finally, even if such a review is performed and state standards are adequately incorporated by DHS,44 any federal scheme must require ongoing analysis of state licensing requirements. This would include analysis of additional states’ regulations should new FRCs open in other states outside of Texas and Pennsylvania. It would also include annual analysis of the Texas and Pennsylvania standards to ensure that any updates to the state standards are timely incorporated into the federal licensing standards. Without such ongoing analysis, DHS could not reasonably claim that the federal standards provide “materially identically assurances” to state standards. 3. 8 CFR § 236.3 (b)(11) – DHS’s Definition of “Non-Secure Facility” Cannot Appropriately Be Used to Classify FRCs, or Similar Facilities, as Non-Secure. As noted above, the FSA requires that children be placed in facilities that are “non-secure,” unless placement in a secure facility is otherwise required.45 The FSA does not, however, define the term “non-secure.”46 DHS seeks to supply a definition for this term in the proposed rule. To the extent that this definition would allow the existing FRCs, or similar facilities built in the future, to be deemed non-secure, it is unacceptable and contrary to prior determinations of the court. DHS states that when a definition of “non-secure” is not provided for by the state in which a facility is located, “non-secure facilities” shall be defined as those in which “egress from a portion of the facility’s building is not prohibited through internal locks within the building or exterior locks and egress from the facility’s premises is not prohibited through secure fencing around the perimeter of the building.”47 In its justification for this provision, DHS notes that it looked to the Pennsylvania code as “a starting point for the proposed definition.”48 DHS’s proposed definition, however, turns Pennsylvania’s definition on its head. In Pennsylvania, a facility is deemed secure if egress from any portion of the facility is prohibited through locks.49 In contrast, under the natural reading of DHS’s definition, a facility could have multiple egress points that are locked and still not be deemed “secure” as long as one egress point is lock-free. If DHS intended to match the Pennsylvania state definition, DHS should consider rewriting its definition to state clearly that a facility is only non-secure if egress is not prohibited in any section of the facility. DHS provides no justification for this significant deviation nor clarity on its definition to this point. 4. 8 CFR § 236.3(b)(5), 8 CFR § 236.3(g)(2), and 45 CFR § 410.101 – DHS’s and HHS’s Revised Definition of “Emergency” and Corresponding References Seek to Inappropriately Expand the FSA’s Exception. The agencies’ proposals to revise and expand the emergency exception ignore the fact that the government voluntarily entered into the FSA and negotiated its terms. Had the government wanted to create a broader emergency exception, it should have attempted to do so before signing the agreement in 1996. Emergency exceptions were clearly a topic of consideration and negotiation between the parties. Indeed, parties to the FSA specifically incorporated the emergency exception in certain sections of the agreement (e.g., in the provisions on transfer to licensed facilities) but chose not to provide similar exceptions for other provisions, such as those that limit housing children with unrelated adults. DHS even admits that its proposal does not adhere to the FSA’s terms, stating that its definition of the term emergency “reflects DHS’s recognition that emergencies may not only delay placement of minors, but could also delay compliance with other provisions of this proposed rule, or excuse noncompliance on a temporary basis.”55 Despite the operational realities that DHS may be facing, such an effort to expand unilaterally the emergency exception and create a safeguard to excuse future breaches of the FSA’s terms is untenable – due to the voluntary nature of the agreement, the fact that the Flores court approved the Agreement, the fact that the parties clearly contemplated when emergencies should excuse non-compliance, and larger public policy concerns. At a minimum, if ORR decides to issue regulations on family reunification standards, we urge it to ensure that these standards are framed as minimum requirements. To do so would help ensure ORR has the flexibility it needs in the future to timely respond and improve standards that promote safety of children, without conflicting with the existing regulations. In sum, USCCB supports the development of minimum standards for family reunification services, but we caution against the use of rulemaking to do so. For the reasons set forth above, the proposed rule fails to adequately implement the terms of the FSA, and DHS and HHS lack the authority to unilaterally make the changes they propose to the FSA. Even if the proposed rule were legally permissible, however, it is objectionable from a public policy standpoint. The NPRM repeatedly seeks to undermine existing protections for children — protections which have served to safeguard immigrant children from neglect, abuse, and exploitation. We urge DHS and HHS either to abandon this rulemaking or to revise the proposed rule to mirror the conditions agreed upon in the FSA. 1 Settlement Agreement, Flores, et al. v. Reno, et al., Case No. CV 85-4544 (C.D. Cal., Jan. 1, 1997), available at https://cliniclegal.org/sites/default/files/attachments/flores_v._reno_settlement_agreement_1.pdf. 2 Apprehension, Processing, Care, and Custody of Alien Minors and Unaccompanied Alien Children, 83 Fed. Reg. 45,468 (Sept. 7, 2018). 3 See, e.g., U.S. Conference of Catholic Bishops/Migration and Refugee Serv., et al., The Real Alternatives to Detention, JUSTICE FOR IMMIGRANTS, available at https://justiceforimmigrants.org/wp-content/uploads/2017/07/The-Real-Alternatives-to-Detention-FINAL-06.27.17.pdf (last visited on Sep. 25, 2018). 4 Stipulation Extending Settlement Agreement, Flores v. Reno, Case No. CV 85-4544 (C.D. Cal., Dec. 7, 2001). 6 Settlement Agreement, Flores, supra note 1, ¶¶ 6,19, 23. 7 83 Fed. Reg. at 45,512. 9 Settlement Agreement, Flores, supra note 1, ¶ 6. 10 Order on Motion to Enforce at 12-13, Flores, et al. v. Johnson, et al., cv-85-4544 (C.D. Cal. July 24, 2015); Order on Motion to Enforce at 29, Flores, et al. v. Sessions, et al., cv 85-4544 (C.D. Cal. June 27, 2017) (quoting the July 24, 2015 order). 11 Order Denying Application for Limited Relief, Flores, et al. v. Sessions, et al., cv 85-4544 (C.D. Cal. July 9, 2018). 12 J. M. Linton, et al., Detention of Immigrant Children, 139 PEDIATRICS 1-13 (2017). 16 Scott Allen, MD & Pamela McPherson, MD, Letter to Senate Whistleblowing Caucus (July 17, 2018), available at https://www.whistleblower.org/sites/default/files/Original%20Docs%20Letter.pdf. 20 ADVISORY COMMITTEE ON FAMILY RESIDENTIAL CENTERS, REPORT OF THE ICE ADVISORY COMMITTEE ON FAMILY RESIDENTIAL CENTERS 2 (OCT. 2016), available at https://www.ice.gov/sites/default/files/documents/Report/2016/acfrc-report-final-102016.pdf. 23 Aria Bendix, ICE Shuts Down Program for Asylum-Seekers, THE ATLANTIC (June 9, 2017), https://www.theatlantic.com/news/archive/2017/06/ice-shuts-down-program-for-asylum-seekers/529887/. 24 This also is assuming that the government could detain a family through the completion of their immigration proceedings. 25 Calculated as $638 per day for a family of two in an FRC ($319 x 2 = $638) and multiplied by the average time to process an individual on the detained docket, 40 days ($638 x 40 = $25,520). For ISAP, calculated as the daily rate for the head of household to be enrolled and multiped by the average time to process an individual on the non-detained docket, 752 days ($4 x 752 = $3,008). Thus, on average, a savings of $22,512 can be estimated if the family is kept on ISAP III as opposed to detaining the parent and child in an FRC. Please note that docket length averages utilized were those supplied by DOJ to the Senate. See Joseph Edlow, Senate Homeland Security and Government Affairs Committee Hearing on “The Implications of the Reinterpretation of the Flores Settlement Agreement for Border Security and Illegal Immigration Incentives” (Sept. 18, 2018), available at https://www.hsgac.senate.gov/hearings/the-implications-of-the-reinterpretation-of-the-flores-settlement-agreement-for-border-security-and-illegal-immigration-incentives (during questioning by Sen. Johnson). 26 Settlement Agreement, Flores, supra note 1, ¶ 6. OF DETENTION FACILITIES DO NOT LEAD TO SUSTAINED COMPLIANCE OR SYSTEMATIC IMPROVEMENTS 4 (2018), available at https://www.oig.dhs.gov/sites/default/files/assets/2018-06/OIG-18-67-Jun18.pdf. 28 Scott Allen, MD & Pamela McPherson, MD, supra note, 16 at 1. 29 83 Fed. Reg. at 45,501. BEHAVIOR MANAGEMENT 2 (2007), available at https://www.ice.gov/doclib/dro/family-residential/pdf/rs_discipline_and_behavior_management.pdf. 32 “A type of emergency behavior intervention that uses the application of a device to restrict the free movement of all or part of a child’s body in order to control physical activity.” 26 Texas Admin. Code, Part I, Chapter 748, Subchapter B, Division 1, Rule § 748.43(37). 33 26 Texas Admin. Code, Part I, Chapter 748, Subchapter N, Division 1, Rule § 748.2451. 34 26 Texas Admin. Code, Part I, Chapter 748, Subchapter N, Division 7, Rule § 748.2705. 35 Note that ICE’s standards use the general term “restraint,” rather than “mechanical restraint,” even when they are referring to devices that would be considered “mechanical restraints” under the Texas regulations (e.g., handcuffs). See U.S. IMMIGRATION AND CUSTOMS ENFORCEMENT, ICE/DRO RESIDENTIAL STANDARD: USE OF PHYSICAL FORCE AND RESTRAINTS 3 (2007), available at https://www.ice.gov/doclib/dro/family-residential/pdf/rs_use_of_force.pdf. 37 Id. at 10, 3. 38 26 Texas Admin. Code, Part I, Chapter 748, Subchapter N, Division 9, Rule § 748.2801. 39 U.S. IMMIGRATION AND CUSTOMS ENFORCEMENT, USE OF PHYSICAL FORCE AND RESTRAINTS, supra note 31 at 3. 41 26 Texas Admin. Code Part I, Chapter 748, Subchapter J, Division 7, Rule § 748.1691. 42 U.S. IMMIGRATION AND CUSTOMS ENFORCEMENT, ICE/DRO RESIDENTIAL STANDARD: FOOD SERVICE 16 (2007), available at https://www.ice.gov/doclib/dro/family-residential/pdf/rs-food-service.pdf. 43 Guidelines for Feeding Healthy Infants, U.S. DEPARTMENT OF AGRICULTURE, https://wicworks.fns.usda.gov/resources/guidelines-feeding-healthy-infants (last visited Sept. 26, 2018). 45 Settlement Agreement, Flores, supra note 1, ¶¶ 6, 23. 47 83 Fed. Reg. at 45,525. 48 Id. at 45,497 n. 14. 49 55 Pa. Code § 3800.5 (stating a secure care facility is one in which “voluntary egress is prohibited through one of the following mechanisms: (i) Egress from the building, or a portion of the building, is prohibited through internal locks within the building or exterior locks. (ii) Egress from the premises is prohibited through secure fencing around the perimeter of the building.”). 50 2015 Order on Motion to Enforce, Flores, et al. v. Johnson, supra note 10, at 15 (“[E]ven if the Court disregards the conditions in, and the unlicensed status of, the facilities, the facilities are secure, which violates the Agreement’s requirement[s].”). 51 See Settlement Agreement, Flores, supra note 1, ¶ 11. 52 Id. at ¶ 12(B). 54 83 Fed. Reg. at 45,525 (emphasis added); accord id. at 45,529. 55 Id. at 45,496 (emphasis added). 58 Settlement Agreement, Flores, supra note 1, ¶ 12 (“The INS will segregate unaccompanied minors from unrelated adults. Where such segregation is not immediately possible, an unaccompanied minor will not be detained with an unrelated adult for more than 24 hours.”). 59 Order Denying Ex Part Application for Limited Relief at 7, Flores et al. v. Sessions et al., Case No. CV 85-4544 (C.D. Cal. July 9, 2018), available at https://www.aila.org/File/Related/14111359ac.pdf. 60 83 Fed. Reg. at 45,507. 61 During a home study, a community-based case worker assesses the safety and suitability of the proposed caregiver and placement, including the caregiver’s capacity to meet the child’s unique needs, any potential risks of the placement, and the caregiver’s motivation and commitment to care for the child. Home studies result in a recommendation on whether placement with the proposed caregiver is in the child’s best interest. 62 Post-release services include risk assessment and action-planning with families around areas of need and concern, connection to community services, and provision of a referral to legal services. Consequently, these services are not only critical to ensuring a child’s safe placement, but they also mitigate the risk for family breakdown, facilitate community integration, and help the family understand the need to comply with their immigration court proceedings. 63 Children Entering the United States Unaccompanied, OFFICE OF REFUGEE RESETTLEMENT (Aug. 30, 2018), https://www.acf.hhs.gov/orr/resource/children-entering-the-united-states-unaccompanied. WASHINGTON POST (Jan. 26, 2016), https://www.washingtonpost.com/national/failures-in-handling-unaccompanied-migrant-minors-have-led-to-trafficking/2016/01/26/c47de164-c138-11e5-9443-7074c3645405_story.html?utm_term=.d4002785484e. 66 Those that are not specifically required by statute. 67 PERMANENT SUBCOMMITTEE ON INVESTIGATIONS, supra note, 64 at 20.
this would open the door to litigation. 5 U.S.C. §553(d)(3); MAEVE P. CAREY, CONGRESSIONAL RESEARCH SERVICE, THE FEDERAL RULEMAKING PROCESS 7 (2013), available at https://fas.org/sgp/crs/misc/RL32240.pdf (“A federal agency’s invocation of the good cause exception (or other exceptions to notice and comment procedures) is subject to judicial review.”). 69 In FY 2017, ORR provided family reunification services for less than thirty-two percent of the 42,416 children released from its care – with only 7% of youth receiving home studies. See Facts and Data, OFFICE OF REFUGEE RESETTLEMENT (June 25, 2018), https://www.acf.hhs.gov/orr/about/ucs/facts-and-data. 70 In USCCB/MRS’s experience, for example, factors such as a youth being a pregnant or parenting teen should be added to the list necessitating a discretionary home study. WASHINGTON—The U.S. Conference of Catholic Bishops’ Office of Migration and Refugee Services (USCCB/MRS) and Lutheran Immigration and Refugee Service (LIRS), released its report today, entitled Serving Separated and Reunited Families: Lessons Learned and the Way Forward to Promote Family Unity, which documents the work of Catholic and Lutheran agencies who assisted the Administration with reuniting separated families during the month of July. In July 2018, USCCB/MRS and LIRS assisted over 1200 families who were reunified after being separated due to the Administration’s “Zero Tolerance” policy. The report highlights the work that was undertaken by Catholic and Lutheran partners on the ground and gives a unique data point regarding the separated and reunited families.